Heavenly blog! : No. 730: The history of the Land of Israel / Palestine! No. 730: The history of the Land of Israel / Palestine! The history of the Land of Israel / Palestine! Has it had any recent conversations with people about the conflict between Israel and the Palestinians. That is about who has the "right" of the country and the country that are currently being fought for, been in the hands of someone else? And it is Israel or the Palestinians who have "right" on the land and Jerusalem. The answer to this, I try in this article to give. And in my opinion then the Palestinians their own homeland if they wish, and it is today Jordan first and foremost. And Israel has a "right" both in the country they currently have. And Gaza Strip, the so-called West Bank and above all Jerusalem. Picture of Jerusalem when really all rests on who is in possession of Jerusalem to have dominion over Israel's "land"! 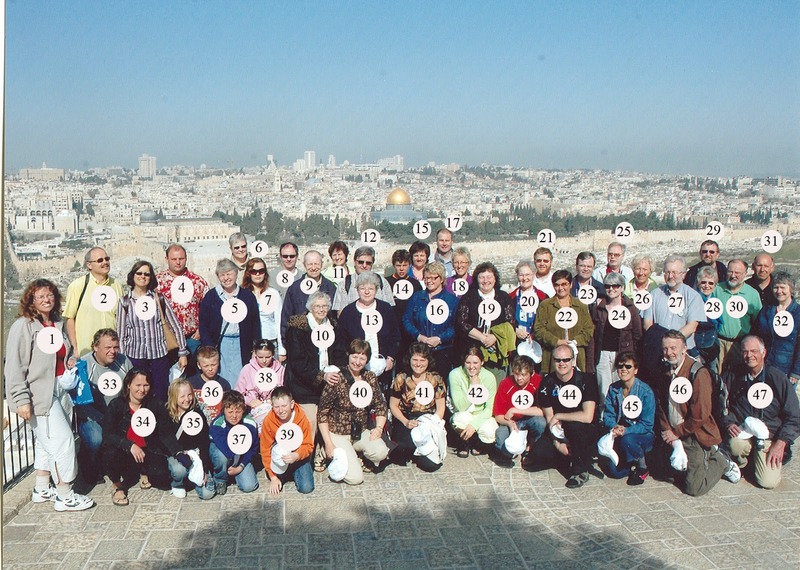 This is when we were in Jerusalem at Easter 2007, we are on the Mount of Olives and Jerusalem in the background. I am no. 4, my wife Berit no. 1, youngest in the family no. 36, and my two daughters No. 7 and 38, we were in Israel in two weeks, would like to take a tour. It is possible to speak out so we can travel together any more. Where does the name Palestine come from? Has anyone Arbabere or Muslims had own land in what is now Israel or around the area? Was Muhammad ever in Jerusalem or Israel? Is there anything to suggest that some Arabs're entitled and legitimate claim to Jerusalem or Israel? Have some Israelites had own land in present-Israel area around? Was Abraham, David or Jesus ever in Jerusalem or Israel? Is there any indication that any Israel or Israelites have a right and legitimate claim to Jerusalem or Israel? Will brief attempt to document this and who has been in possession of the land of Israel and Jerusalem. Where does the name Israel from? From Wikipedia: The name "Israel" has for the last three thousand years become used to both Israel and the entire Jewish nation, both in common and religious context. The name derives from a verse in the Bible (Genesis 32.28) where Jacob is renamed Israel after a successful battle against one of God's angels. There are different opinions about what the name means. Some believe that the name comes from the verb SARAR ("to rule, be strong, have authority over"), and the meaning is thus "God rules" or "God judges". Other possible meanings is "the prince" (King James Version) or "El (God) fights / conflicts". Regardless of the exact name meaning, the biblical nation of Jacob been called "Children of Israel" or "Israelites". The word "Israel" was first used in the Merneptah Stele by ancient Egypt (dated back to the 13th century BC), although researchers disagree about it here refers to a people or a country. Present land was named Medinat Yisrael (the State of Israel) after other proposed names, including Eretz Israel ("the Land of Israel"), Zion, and Judea had been rejected. During the first time as an independent state government decided that the term "Israelis" would signify Israel's citizens, by a formal announcement by Foreign Minister Moshe Sharett. Between the Jewish kingdoms and the Islamic conquests of the 700s came Israel under Assyrian, Babylonian, Persian, Greek, Roman, and Byzantine rule sasanideisk. The number of Jews living in the region was less after the failed Bar Kokhba revolt against the Roman Empire in the year 132 and the subsequent banishment of the Jews. Nevertheless, it retains a Jewish settlement in Palestine, although the majority of the Jewish population moved from Judea to Galilee. Mishnah and part of the Talmud, one of Judaism's most important religious texts were compiled in this period. Israel was separated from the Byzantine Empire around the year 636 BC during the initial Muslim conquests. Control of the region went back and forth between umayyaderne, abbasiderne and crusaders for the next six centuries, before it fell into the hands of the Mamluks in 1260. In 1516 the country was Israel a part of the Ottoman Empire which ruled the region until the twentieth century. When was Israel and the Jews scattered? Complete this year. 70 AD As a result of the first Jewish war against the Romans was Jerusalem and the Temple in ruins by the Romans under Titus in 70 CE After Bar Kokhva uprising (132-135 CE) made ​​emperor Hadrian Jerusalem a pure Roman city Aelia Capitolina under the name. Jews now had no access to the city. The restoration of Israel and the return for almost 2,000 years in exile. From Wikipedia: The Jewish diaspora. The Jewish Diaspora, sometimes referred to only as the diaspora is a term used for Jews living outside Israel. Originally the term denoted the displacement of the Jewish people during the Babylonian and the Roman Empire. They later spread around the world because of persecution or conversion. It is common to assume that the diaspora began with hærtakingen of the ancient Jewish kingdoms and the expulsion of the Jewish people in the eighth to the sixth century before Christ. A number of Jewish communities were established in the Middle East as a result of tolerant policies and remained important centers of Judaism in the centuries to come. The defeat of the Great Jewish Revolt of 70 CE and the Bar Kokhba revolt in the year 135 the Roman Empire made ​​it so that several spread over larger geographical area, as many Jews were scattered after losing their country, Judea or were sold slavery throughout the empire. Zionism, a term for the Jewish people's desire and hope to return to Jerusalem and the Land of Israel (Zion). The idea dates back to the Babylonian exile (586-538 BCE) and is expressed in the prophets, in the messianic beliefs in the Jewish liturgy and folkloric traditions. Modern Zionism arose towards the end of the 1800s as a response to continued discrimination and increasing anti-Semitism in Europe, where the anti-Jewish propaganda is now also concerned people and race. The new national trends in Europe meant that the Jews also began to regard themselves as a nation with the right to own land. Pogroms in Russia from 1881 to 1882 led to the formation of Hovevei Zion (Zion's friends), who created and supported the new agricultural colonies in Palestine. Jewish writers and thinkers (Moses Hess, Ascher Ginzberg, Martin Buber) sought to revitalize Jewish culture and identity with the Jewish ancient homeland as the center. To revive Hebrew as a spoken language was an important part of this idea. Political Zionism was founded by Theodor Herzl at the first Zionist Congress in Basel in 1897, where the World's Zionist Organization was founded. The goal was "to create a legal and safe home for the Jewish people in the Land of Israel." Jewish National Fund (Jewish National Fund) was created in 1902 with the purpose of buying land and create agricultural cooperatives. The first land was bought already in 1905 and beyond in the 1900s came ever new waves of Jewish immigrants to Palestine. Zionism was basically a secular political movement, but already in 1902 formed the organization's religious members of a religious-Zionist branch Mizrahi, who would ensure that the new Jewish community also received a traditional religious character. Ultra-Orthodox leaders were strong opponents of the political Zionist idea, which they believed was anticipating the will of God. By real political reasons it was nevertheless formed an ultra-Orthodox political movement called Agudat Israel, who would later play an important role in Israeli domestic politics. The first years concentrated Zionism on achieving international guarantees, especially from Turkey who ruled Palestine. The First World War changed the political situation. As a result of long negotiations with Chaim Weizmann and Nahum Sokolov extended the British Foreign Secretary Arthur J. Balfour in 1917 was the declaration that pledged to support the creation of a national home for Jews in Palestine. In 1922 the League of Nations gave Britain a formal mandate to govern Palestine from the Balfour Declaration assumptions. Jewish interests should be managed by the newly created organization, the Jewish Agency. World Zionist leader Chaim Weizmann Organizations also became the first head of the Jewish Agency. In mandate currently working Jewish Agency both to oppose British restrictions on Jewish immigration and to support immigration and contribute to settlement and integration. After the State of Israel in 1948, Jewish Agency primarily responsible for immigration to the country. From 1948, the Jewish Agency has assisted more than 2 million. Humans to immigrate to Israel, among which was around 800,000 from Muslim countries. Since 1989, the organization contributed to it has come around one million. Immigrants from the former Soviet Union to Israel. Where are Arabs or Palestinians in? For those who have studied the history of Israel that we are here, that Israel's land barren and desolate in the 1800s when Zionism emerged with the return train to the land of Israel. Mark Twain wrote in his book Innocents Abroad (1869): "Of all the gloomy and deserted land Palestine must be ... top. The hills are barren .... The valleys are unsightly deserts .... Dead Sea and the Sea of ​​Galilee lies dormant in a large stretch of hills and plains where no color shades gives the eye rest .... It is a bleak, wild and inhospitable land without hope. I was so happy to see Jordan's shoreline spring, Shechem, Esdraelon, Ajalon and the border with Galilee - but even then these spots was as far as scattered toy gardens in a wasteland of boundless misery .... Palestine sits in sackcloth and ashes. Over brooding curse that has been shown to fade and has added power and real desire to ... iron. Only weeds growing, spreading stems and tufts .... Nazareth is deserted. By Jordan ford where Israeli troops entered the Promised Land with singing song is only a paltry camp of eccentric ørkenbeduiner. Jericho is condemned, currently lying in a bortsmuldret ruin, as Joshua's miracle left town for more than 3,000 years ago; Bethlehem and Bethany, in poverty and humiliation .... Legendary Jerusalem, the most majestic name in history, has lost all its ancient grandeur and become a poor village .... The famous Sea of ​​Galilee ... a silent wilderness. Capernaum is a shapeless ruin; Magdala is the home of begging Arabs ... Palestine is desolate and without beauty. And why should it be any different? Can Deity curse make a country beautiful? .... The expedition name, published under the title The amusement excursion to the Great Holy Land, was misleading. Funeral Procession for the Great Holy Land would have been better - much better. " When the wax tion of a country, and the population of skilled and talented people, so also needed than labor. It came ia Bedouins and Arabs of Israel to help. It is these Arabs who are now becoming Palestinians who claim a land they have never lived in as a united people, has any ownership right. Deep thinking is everything and it all lies, fabricated things and manipulations that Palestinians claim the land of Israel as their own. It belongs to the Arabs and not his, but his Israelite! Even God says that this land belongs to the children of Israel: Ezekiel 20 42 And you shall know that I am the Lord when I bring you into the land of Israel, the land which I lifted hand promised to give your ancestors. 37 12 Therefore prophesy and say unto them, Thus saith the Lord God: Behold, O my people, I open your graves and cause you to ascend the grave. I will bring you into the land of Israel. To try to say that the Gaza Strip, West Bank, Jerusalem and other parts of Israel does not belong to Israel, is basically going against God!